For 130 years, The Royal Conservatory of Music (RCM) has offered an internationally renowned program of music study and assessment through its certificate program. Today, the RCM Certificate Program is considered one of the finest music education systems in Canada and around the world. The program provides students with world-class, well-rounded musical training, from elementary through to advanced levels. With the completion of each level, students further hone their skills and develop their ability to play music independently while nurturing a lifelong appreciation for music making. What is The Royal Conservatory Certificate Program? The RCM Certificate Program is a comprehensive and effectively sequenced program of music study and assessment, beginning with the Preparatory level(s), followed by levels 1 to 10, and concluding with the Associate Diploma of The Royal Conservatory of Music (ARCT). A Licenciate Diploma of The Royal Conservatory of Music (LRCM) is available for piano. At each level, a Certificate of Achievement can be earned by successfully completing a Royal Conservatory practical examination. High quality: The Royal Conservatory offers a rigorous, internationally renowned standard of music education, discipline and assessment. 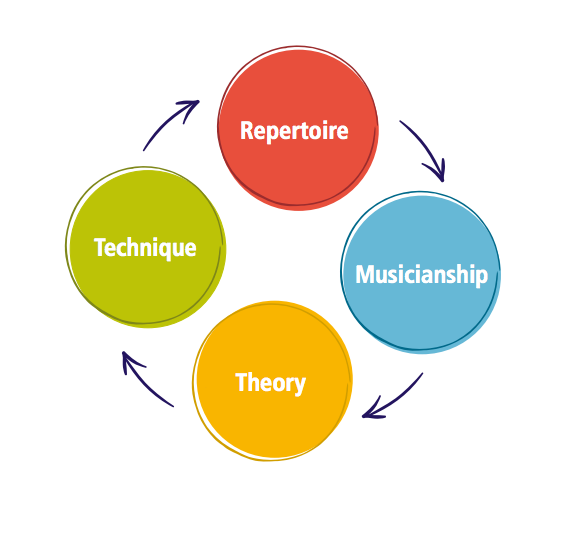 Comprehensive: The RCM Certificate Program incorporates repertoire, etudes/studies, sight-reading, ear training, technique and theory for multiple disciplines. Structured: The program provides a clear levelled path for well-rounded musical training, and a consistent and meaningful structure for recognizing achievement, and rewarding excellence. Recognition of Achievement: Student performance is recognized at each level through examinations and regional and national awards. Students can celebrate their accomplishments and track their progress. Credit: Achievement in examinations is recognized as credit toward secondary school graduation in many Canadian schools, as well as being an important element in entrance requirements for college and university music programs. Accredited Assessment: Examinations are professional, objective and consistent, delivered by accredited examiners for students at all levels of study. Pedagogical Support:Teachers receive support through published syllabi, series and other academic resources such as official examination papers and sample examinations. Ongoing professional development opportunities are also available via online resources, courses and regional workshops. Convenient: Both students and teachers can register online for the certificate program with no additional fees or administration required. Adaptable: Teachers may choose their own pedagogical approaches and methodologies for their students. Lifelong Enjoyment of Music: The skills that students acquire through The RCM Certificate Program will give them the musical proficiency and the tools they need to enjoy playing music for the rest of their lives. Our integrated curriculum encompasses repertoire as well as etudes, ear tests, sight reading, theory, and technique. Our program focuses mainly on classical music with opportunities to play jazz, folk and popular music. The RCM's classical training provides the strongest possible foundation upon which to continue a student's musical journey. Not only does the curriculum teach the essential elements of musical training but it also encourages students' enthusiasm for music, empowers artistic expression and celebrates achievements. The RCM Certificate Program is considered the "gold standard" in many countries for its ability to develop high-calibre musical literacy. Each year, more than 30,000 teachers motivate more than 500,000 students to participate in music making. The program has been proven to be a powerful tool for developing children's intellectual, social and creative potential. With a focus on nurturing creativity and developing self-confidence, the program allows students to work at their own pace. The program motivates students, helps them set and achieve goals and instills a sense of accomplishment as they complete each level. RCM National Music Teacher Directory helps you to easily find a teacher near you. Print and digital resources to support each level of RCM study.